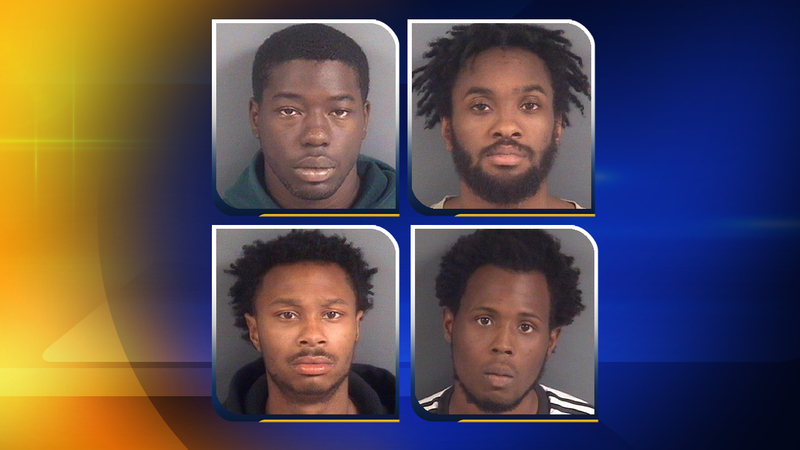 FAYETTEVILLE, North Carolina (WTVD) -- Fayetteville Police have arrested and charged four suspects in connection with stealing guns from a home Saturday. The burglary happened about 1 a.m. in the 1800 block of Cherokee Drive. Police said 10 firearms were stolen. An anonymous 911 call tipped off police to the possible residential burglary in progress. When officers got to the home, they saw the four suspects running away on foot. After a brief foot chase, officers took four suspects into custody. Police said the four stole guns, ammunition, and other items. Darryl F. Baker, 20, of the 4300 block of Cam Strader Drive, in Wilson, has been charged with second-degree burglary, larceny after second-degree burglary, felony possession of stolen goods, felony conspiracy, larceny of a firearm (10 counts), and possession of a stolen firearm (10 counts). Baker is being held at the Cumberland County Detention Center on a $100,000 secured bond. Stevie M. Reed, 23, of the 1400 block of Thelbert Drive, has been charged with second-degree burglary, larceny after second-degree burglary, felony possession of stolen goods, felony conspiracy, larceny of a firearm (11 counts), possession of a stolen firearm (11 counts), possession of a firearm by a felony, and carrying a concealed gun. Reed was in possession of a firearm stolen from a previous breaking and entering investigation, police said. Reed is being held at the Cumberland County Detention Center on a $140,000 secured bond. Tyler O. Smith, 18, of the 1800 block of Bridger Street, has been charged with second-degree burglary, larceny after second-degree burglary, felony possession of stolen goods, felony conspiracy, larceny of a firearm (10 counts), and possession of a stolen firearm (10 counts). Smith is being held at the Cumberland County Detention Center on a $58,000 secured bond. Antonio D. Tippitte, 31, of the 600 block of Langdon Street, has been charged with second-degree burglary, larceny after second-degree burglary, felony possession of stolen goods, felony conspiracy, larceny of a firearm (10 counts), and possession of a stolen firearm (10 counts). Tippitte is being held at the Cumberland County Detention Center on a $120,000 secured bond. "The FPD continues to encourage citizens to immediately report suspicious activity by calling 911," police said in a news release. "The person who called 911 to report this in progress burglary was paramount in preventing these firearms from possibly being used in future crimes."